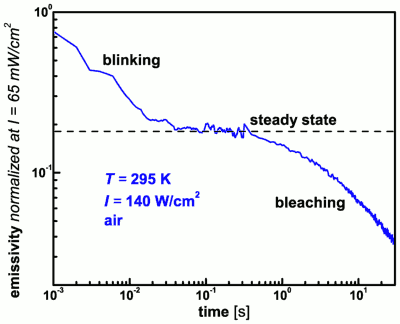 Photoblinking and photobleaching, i.e. reversible and irreversible transitions to non-emissive states, are two phenomena which limit the scope of single-molecule experiments at room temperature. We have used the laser dye rhodamine 6G in a poly(vinyl alcohol) matrix as a model system to study the mechanism of photoblinking and photobleaching, with special emphasis on the influence of temperature and the composition of the ambient atmosphere on the efficiency of these processes. The experimental setup, shown above together with the chemical formulas of R6G and PVA, used a variable-temperature cryostat to control the sample temperature and the ambient atmosphere. The sample itself was a thin film of R6G in PVA which was deposited on a quartz substrate by spin-coating. A 10×10 pinhole array mask was placed on the sample film and a manual scan mirror allowed us to address each of the pinholes (diameter: 40 microns) as one of 100 independent samples. The illumination conditions were chosen such that the intensity over the pinhole diameter was nearly constant. 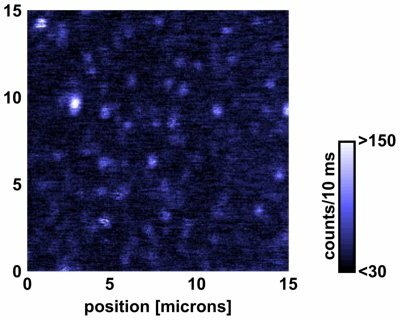 The collected fluorescence was detected by a photomultiplier after spectral filtering by dichroic beam splitter and a notch filter, as well as spatial filtering by a 150 micron pinhole. A normalization diode registered the light transmitted through the sample to allow us to account for slight differences in the area of the individual mask pinholes. We found that we could distinguish between blinking and bleaching in our ensemble experiments: When the fluorescence emissivity is monitored as a function of time after starting to illuminate the sample we first find a reversible decay in emissivity which reaches a steady state before the irreversible bleaching starts, see the figure above. The intensity dependence of the blinking decay and the steady-state emissivity level give access to the population and depopulation rates of the non-emissive state which is responsible for the blinking. Our combined experimental evidence points to a radical dark state which is populated via the triplet state, and this has been independently confirmed by an EPR measurement performed in our group by Serguei Orlinski. It is straightforward to incorporate photobleaching processes in the kinetic description of the dark-state photoblinking. Here we could show that the measured bleaching behavior at low illumination intensity can only be extrapolated to higher intensities if excitation of the dark state(s) is included as a channel that can lead to accelerated bleaching from these excited non-emissive states. As far as single molecules are concerned, we found that their bleaching times (survival times) are broadly distributed at all temperatures. (The image above shows an example of single molecules at 1.5 Kelvin.) The overall photostability increases at low temperatures, and more than one third of the molecules live longer than 1000 s under continuous illumination in liquid helium.